A sada na brzinu, moramo znati koliko komada ću naručiti. Za sada ne morate ništa plačati, to će mo kasnije, ali ko želi može i to odmah obaviti. Bitno mi je da hitno doznam hoću li naručiti 50 komada ili više. Napominjem, a valjda se i sječate od prošle godine, vjerovatno više neće biti rednih brojeva na upaljačima, već će na svima pisati LIMITED 1/50 ili više. 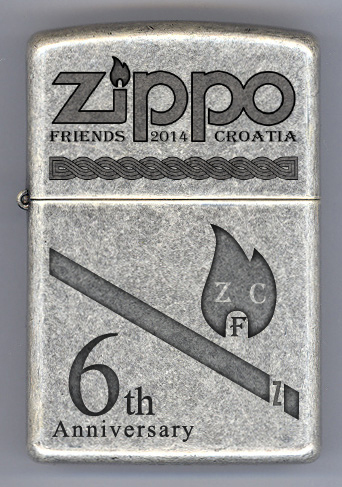 Yes i want one ZFC 2014 zippo and if numbered, No.31 please. Fantastic design and well done to all for some very good designs. I paid on mine today because I had the money and wanted to be one of the first PAID members. Damir and Robert work very hard and long to make sure the members get a quality piece for their collections. The designs are chosen fairly and everyone that wants to, can submit an idea. It is up to us ( the members ) to help out in any and every way we can, by paying as soon as funds allow, we insure this process will continue for years to come. We are a diverse group of collectors, old farts and students, guys and girls, from all kinds of backgrounds. Only by working together as a team, will this club survive. I am very proud to be a member of the ZFC team. I still do not know what will be the price for a lighter! we have time to pay! All members will receive a message with the information for payment! yet it is unknown whether we have the numbers or not!